Adorable Pup Has The Time Of His Life Relaxing In A Tiny Bath Tub! We have all at one point or another spent a lovely time splashing about in a wading pool or a bucket. As a baby, this is how you’d be washed as well, since it is one of the safest ways to do it! Therein probably lies our fascination with bathtubs, since we can completely submerge ourselves and enjoy the water! 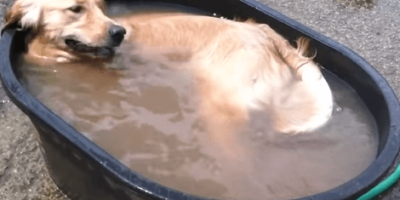 This Golden Retriever pup named Newman is having the absolute time of his life in this black tub! You can see the absolute glee on his face even as he moves around inside the tub to find a comfortable spot. He could easily just stand up to readjust his position, but he insists on keeping as much of his body submerged as possible! Looking at that dirty tub water suggests two things, however – one, the water he jumped into was already muddy. Two, this pup is incredibly dirty! Either way, he needs a wash! Wait Till You See How These Adorable Siblings Take A Walk Together! Wait Till You See How This Pup Reacts After Taking A Bath! Aww!! Too Cute!